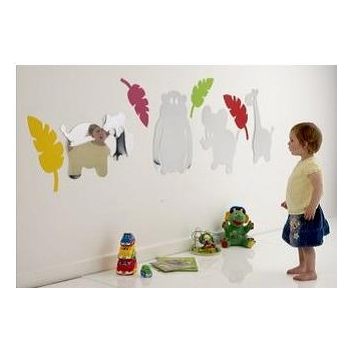 Jungle Mirror Set* - Set Of 4 Lightweight Plastic Safety Mirrors With Decorative Stickers. With Self-Adhesive Pads For Wall Mounting (Indoors). No Mountings For Outdoor Use Supplied. Decorative Stickers For Indoor Use Not Suitable For Outdoor Use. Each Mirror Approx 500Mm X 500Mm. For Indoor Or Outdoor Use (See Instructions).